1. My poor baby isn't feeling well. It makes me feel so helpless! Yesterday, and most of today, has been spent cuddling on the couch. 2. The crochet hook that I am using to make the hat with the yarn from Fangrrl Fiber Arts disappeared under the couch for most of yesterday. Since Catherine was resting there I decided to leave it for a while. So I did the only logical thing to do, I started a new crochet project with a different hook! 3. I am hosting a giveaway for a Custom Dyed Skein of Yarn from Fangrrl Fiber Arts! 5. 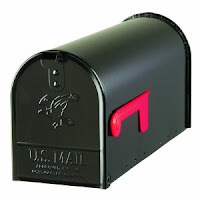 I dislike not having a "traditional" mailbox. If I want to mail something I either have to walk to the big blue mailbox (admittedly not far nor difficult) or catch the mailman as he's delivering my mail. I do like that our mailman is super nice and that I can hand him packages less than a pound to mail out! (This is great for Etsy & Ebay stuff!) Growing up we had a traditional mailbox, although it was removed from the house quite a bit, but until I lived here I didn't know how convenient that little red flag actually was! What type of mailbox do you have? How far away is it? Do you have to go far to mail something? 6. Does anyone follow the Cake Wrecks blog? I often find it hilarious--and sad. Some of my favorites are the "What the Bride Ordered vs. What She Got" posts (like this one, or this one, or this one) . I feel terrible for the bride, but hope that since it was submitted to CW she is able to find the humor in the situation. But wow, just wow! I am by no means a cake decorator, but I certainly could do better than a lot of those "professional" decorators! but this is one that I have on this computer. 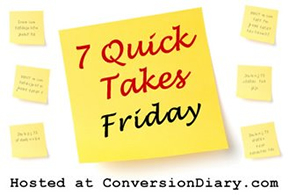 Check out more Quick Takes at Jen's blog, Conversion Diary. I have a couple of others! Check them out!